Located on the Northern seashore in the province of Messina, Santo Stefano di Camastra is a lovely little village, part of the Park of Nebrodi Mountains, best known for its refined and historical tradition of ceramics production. In this area we selected a few estates on the stretch of coast between Santo Stefano and Capo d’Orlando, you can check them out on our Capo d’Orlando villas catalogue. A walk through its streets is a walk among colorful shops rich in true masterpieces: the most traditional and picturesque mosaics, tiles, shingles… all realized with local wonderful ceramics. Pleasant sandy beaches can be found in the area as well, and the water is particularly clean and transparent; moreover, plenty of excursions in the Nebrodi park can be organized from here. This wonderful mountain chain is rich in gorgeous landscapes, valleys, lovely villages perched on hilltops with picturesque traditions and flavoursome local delicacies – such as the well-renowned “suino nero dei Nebrodi” (black pig), as well as cheese, olives, honey and mushrooms. 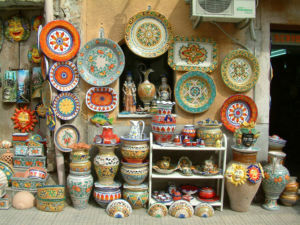 Pottery is one of the oldest Sicilian traditions. You will find artisans who create incredible hand-crafted ceramics all over the island. The most famous “pottery towns” along with Santo Stefano are Caltagirone (also thanks to its ceramic staircase) and Sciacca. Hand-crafted pottery is a typical Sicilian souvenir you could easily collect spending your holidays in one of our Sicily villas with private swimming-pool wether its location.